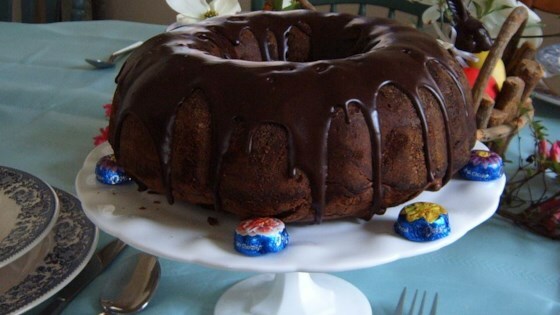 "The ONLY perfect tunnel of fudge cake recipe I can find - it came from a 1950's flour package." In a large bowl, cream together the butter and white sugar until light and fluffy. Beat in the eggs one at a time. Gradually blend in 2 cups confectioners' sugar. Beat in the flour and 3/4 cup cocoa powder. Stir in the chopped walnuts. Pour batter into prepared pan. Bake in the preheated oven for 60 to 65 minutes, or until a toothpick inserted into the center of the cake comes out clean. Let cool in pan for 1 hour, then turn out onto a wire rack and cool completely. For the glaze: In a small bowl, combine 3/4 cup confectioners' sugar and 1/4 cup cocoa. Stir in milk, a tablespoon at a time, until desired drizzling consistency is achieved. Spoon over cake. This cake was extremely heavy and more like fudge. My boyfriend has been wanting me to make this for him (his grandmother used to make it)...but I have yet to find the right recipe!